Cooking is one of the oldest of technologies—and for obvious reasons: humans would never have survived (let alone thrived) without perfecting the art of feeding themselves. The basic idea of cookery—heating food to kill bacteria and make something nutritious and tasty—is fairly prehistoric: "food plus fire equals cooked food" is roughly how it goes. There's not an awful lot of difference between roasting a hunted animal on an open outdoor fire, as our ancestors would have done, and cooking it with electricity or gas in an oven, as we do today. That's not to say there's been no progress in cooking technology. In the 20th century alone, ingenious inventors came up with two brand new forms of cooking. One, the microwave oven, uses high-energy radio waves to heat food quickly and efficiently in a fraction of the time you need with a conventional stove. The other, induction cooking, uses electromagnetism to turn cooking pans into cookers (creating heat energy inside the pan itself, instead of firing it in from outside), which cooks food more quickly and safely with less energy. Everyone knows about microwaves these days, but induction cookers are much less well understood. Let's take a closer look at exactly what they are, how they work, and whether they're better or worse than more familiar forms of cookery. 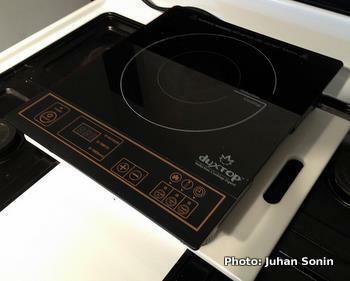 Photo: Induction cooktops, made from easy-to-clean toughened glass, look much the same as other ceramic cooktops. 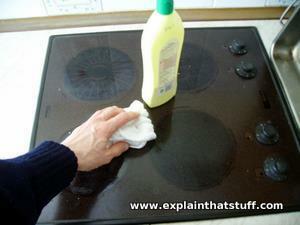 It's important to know that only cookware with an iron base will work properly with a cooktop like this. Most new pots and pans are very clearly labeled and it's relatively easy to find cooking products that are compatible. Photo by Juhan Sonin published on Flickr under a Creative Commons Licence. Before you can understand induction cooking, you need to understand induction. And the first thing you need to know is that "induction" is a shortened way of saying "electromagnetic induction." In a nutshell, induction means generating electricity using magnetism. It stems from the simple fact that electricity and magnetism aren't separate, unconnected things (as we originally learn in school) but two different aspects of the same underlying phenomenon: electromagnetism. 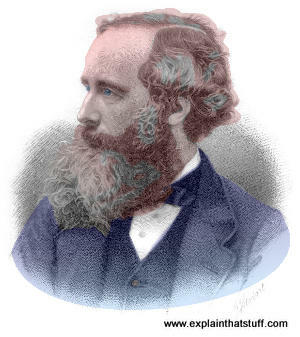 Photo: James Clerk Maxwell, who described the science of electromagnetism in four equations. Public domain photo by courtesy of Wikimedia Commons. A handful of brilliant European scientists figured out the science of electromagnetism—the mysterious relationship between electricity and magnetism—in a period of roughly 40 years spanning the middle of the 19th century. Their findings have proved to be among the most important discoveries ever made: scientists had known about electricity since ancient times, but understanding the science (and technology) of electromagnetism made it possible to power the world with electricity for the first time. It all started in 1820. A Danish physicist named Hans Christian Oersted found that when a fluctuating electric current flows down a wire, it creates an invisible pattern of magnetism all around it (a magnetic field, in other words). The next year, French physicist Andre-Marie Ampère took this experiment a stage further: he found that two wires carrying fluctuating electric currents, placed near to one another, will either attract or repel one another—a bit like two magnets—because the magnetic fields they produce cause a force between them. So far, the emerging science of electromagnetism was completely theoretical: very interesting, but not much use. Things took a much more practical twist when the brilliant English physicist and chemist Michael Faraday figured out how he could use electricity and magnetism to develop a very primitive electric motor, also in 1821. He placed a magnet near a piece of wire into which he fed an electric current. As the current flowed through the wire, it generated a magnetic field around it (in the way Oersted had found), pushing itself away from the magnetic field that the permanent magnet generated. Other inventors (notably Englishman William Sturgeon and American Joseph Henry) went on to develop practical electric motors, while Faraday continued to experiment with the science. In 1831, he pulled off the opposite trick: he showed how rotating a coil of wire through a magnetic field would make an electric current flow through it—inventing the electricity generator that would soon (in the hands of pioneers such as Thomas Edison) bring electric power to the world. The science of electromagnetism (how electricity can make magnetism and vice-versa) was finally nailed down by Scottish physicist James Clerk Maxwell in the 1860s. Maxwell summarized everything that was then known about electricity and magnetism in four beautifully simple, crystal clear, mathematical formulas. Maxwell's equations, as we now call them, still form the foundations of electromagnetic science today. You don't need to know much about electromagnetism to understand induction cookery—simply that a changing electric current can make magnetism and a changing magnetic field can make electricity. When you hear someone talking about induction, or something that uses induction, all it means is that magnetism is being used to generate electricity. A common use for induction is in electric toothbrushes, which have one or two rechargeable batteries packed inside. The trouble with electric toothbrushes is that they get wet, so they need to have completely sealed plastic cases to keep their mechanisms safe and dry. But that creates a different problem: if they're completely sealed against water, how can you get electricity inside to recharge them? A conventional charger socket would be an open invitation to water as well. That's where induction comes in. When your toothbrush battery runs flat, you sit it on a little plastic charger unit to recharge it. 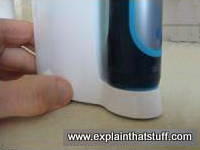 Although there is no direct electrical connection between the toothbrush and the charger (both are made of plastic), electromagnetic energy flows from the charger into the toothbrush battery by induction, straight through the plastic that separates them: a coil of wire in the charger produces a magnetic field that induces an electrical current in a similar coil in the base of the toothbrush. You can find out more (and see some diagrams of exactly how it all works) in our main article on induction chargers. Photos: Electric toothbrushes charge by induction: electromagnetic induction allows energy to flow from the (white) charger to the battery in the (dark blue) brush even though there is no direct electrical connection between them. When you stand a suitable cooking pan on top of an induction cooktop that's powered up, the magnetic field produced by the cooktop penetrates the metal of the pan. So we have a fluctuating magnetic field moving around inside a piece of metal (the base and sides of the pan)—and that makes an electric current flow through the pan too (that's all that induction means). Now this is not quite the same as the electric current that flows through a wire, carrying electrical energy in a straight line from (say) a battery to a flashlight bulb. It's a kind of whirling, swirling electric current with lots of energy but nowhere to go; we call it an eddy current. As it swirls around inside the metal's crystalline structure, it dissipates its energy. So the metal pan gets hot and heats up whatever food is inside it, first by conduction (it passes its heat energy directly to the food) but also by convection (liquid food rises and falls in the pan carrying heat with it). Read more about heat transfer in our main article about heat energy. An induction cooker looks much the same as any other ceramic cooktop, usually with distinct zones where you can place your pots and pans. The cooking surface is usually made from tough, heat-resistant glass-ceramic such as Schott CERAN®. Inside each cooking zone, there's a tightly wound coil of metal. When you turn on the power, an alternating current flows through the coil and produces an invisible, high-frequency, alternating magnetic field all around it. Unless there's a pan on the cooking zone, no heat is produced: the cooking zone remains cold. You might be wondering why we need a high frequency. Although your home power supply alternates at about 50–60Hz (50–60 times per second), an induction cooktop boosts this by about 500–1000 times (typically to 20–40kHz). Since that's well above the range most of us can hear, it stops any annoying, audible buzzing. No less importantly, it prevents magnetic forces from shifting the pan around on the cooktop. Place a pan on the cooking zone and the magnetic field produced by the coil (shown here with blue lines) penetrates the iron inside it. 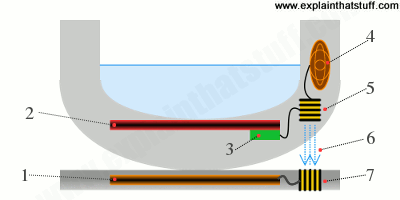 The magnetic field induces whirling electrical (eddy) currents inside the pan, turning into a heater (shown here in orange). Heat from the pan flows directly into the food or water inside it (by conduction). Photo: Gas burners are easy to control, but waste energy by heating the surrounding air and the cooktop as well as the food in the pan. 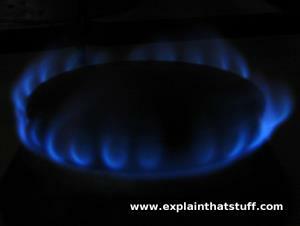 Since they're naked flames, they're more likely to cause a fire than any electric method of cooking. If you can easily cook with an electric ring or a gas-powered stove, why use an induction cooktop at all? There are quite a few good reasons. A traditional cooker generates heat energy some distance from the cooking pot or pan and attempts to transport as much of that energy into the food as possible—with varying degrees of success. If you've ever cooked food on a campfire, you'll know that it's great fun but takes forever. The main reason is that a huge amount of the energy you produce on an open fire is radiated out into the atmosphere; great for ambience, but very slow and inefficient. Even cooking at home can be quite inefficient: you're wasting energy heating the cooktop and (in the case of a stove with a roaring gas flame) the air all around your pots and pans. With induction cooking, the heat is produced in the pan, not the cooktop, and much more of the energy goes into the food. That's why induction cooking is more energy efficient than most other methods (around 84 percent compared to 71 percent for a traditional cooktop). Induction cooking also gets energy to the food more quickly, because pans that get hotter faster cook faster. Typically, it's around 25–50 percent faster than other methods, which can be a big plus for restaurants if it helps get dishes to the table more quickly. Induction cookers are usually built into ceramic or glass cooktops (similar to halogen cooktops), which are very easy to keep clean with just a quick wipe. The magnetic fields they produce make heat appear in the pan almost instantly—and they can make it disappear instantly too. That's very different from traditionally heated pans, which take a while to get hot, so there's a greater risk of burning your food if you don't pay attention! You can turn the heat up or down with as much speed and control as a gas cooker (unlike a traditional electric cooktop, which takes some time to heat up or cool down). Even so, it's a different form of cooking and it does take some getting used to: you have to learn which numeric value on the dial corresponds to the amount of heat you need, and that takes practice (to be fair, that applies to any new form of cooking you might try). On the other hand, induction cooktops are easy to switch on or off automatically, so some feature built-in timers, built-in temperature sensors, and even remote control from simple smartphone apps. There's no open flame on an induction cooktop and (until there's a cooking pan actually present) no heat to burn you. Heat appears only when the cooking pan is in place—and the cooktop itself can never get any hotter than the pan sitting on top of it. Electronically controlled cooktops can detect whether pans are standing on them and how much heat they're producing, and most will cut the power out automatically if they're left on by mistake or if a pan starts to boil dry. Induction cookers built into ceramic cooktops are only a couple of inches thick so they can be fitted at any height (good for disabled people in wheelchairs who might want a low-level kitchen). Photo: Ceramic cooktops are strong, durable, and easy to wipe clean in seconds (burned-on food can be gently and carefully removed with a shallow blade). This one is made from a glass-ceramic called Schott CERAN®, widely used in cooktops since it was first introduced in 1971. It's heat resistant (up to at least 700°C or 1300°F), capable of surviving sudden temperature changes, and highly energy efficient (carrying over 80 percent of the heat from the induction coil underneath it to the cooking pan above). Until recently, cost was the biggest disadvantage: a typical induction cooktop could be two or three times more expensive than an ordinary electric or gas cooktop and, even though you'd save energy, the energy savings weren't usually significant enough to pay back the difference. The price of induction cooktops has now fallen significantly and there's much less difference in cost compared to ordinary ceramic cooktops. Even so, don't buy an induction cooker with the expectation that you'll see your energy bills fall: cooking represents only a small fraction of the total energy most people use at home and any savings you do make (though welcome and important for the environment) will be modest. Another drawback is that induction cooking only works properly with cooking pans containing iron—the only metal that efficiently produces electrical (eddy) currents and heat from magnetic fields. Copper and aluminum pans and glass cookware don't work. Iron-based pots and pans compatible with induction cooktops are widely available, so the cookware issue is only really a problem if you have a large collection of existing, unsuitable cookware you're not prepared to replace. Indeed, some people even see it as an opportunity to upgrade. If you are going to replace your cookware, you could investigate "cool-touch" pots and pans made specifically for induction. Some have insulated outer bodies (made from ceramics or heatproof plastics) that stay relatively cool to the touch, with lumps of stainless steel or iron embedded in them to pick up the magnetic field from the cooktop and turn it into heat. Some have built-in temperature sensors that help the cooktop to regulate the power it needs to supply, which also enables automatic, remote control from things like smartphone apps. Artwork: Some induction cookers use smart pans with built-in sensors. Here's an example of how one works. 1) The coil in the cooktop generates a magnetic field. 2) A piece of iron or steel embedded inside the pan picks up the field and converts it into heat. 3) A thermocouple (electrical temperature sensor) directly underneath continually monitors how hot the pan is getting. 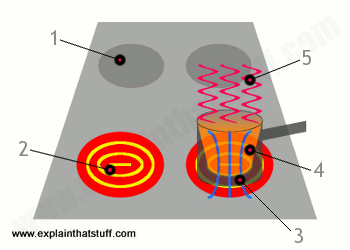 4) A separate induction coil inside the pan picks up energy from the cooktop and converts it into just enough electrical power to drive a small radio transmitter. 5) The transmitter sends information from the temperature sensor back to the cooktop (6). The cooktop picks up the radio signal (7) and raises or lowers its power as necessary. Two other minor issues worth noting are that induction cooktops can produce a small amount of noise (from built-in cooling fans) and radio-frequency interference that might pose a very small risk for people wearing heart pacemakers (no greater than the risk posed by other everyday electrical equipment). Should you buy an induction cooktop? If you like the speed and control of gas, but prefer the wipe-clean convenience of a ceramic cooktop, and the relatively high initial purchase cost is not an issue, induction cooking might be worth considering. Don't buy to make savings through energy efficiency; you probably won't. Check your existing cookware before you buy; if you have to purchase an entire new set of quality pots and pans, that could add significantly to the outlay of switching to induction cooking. Hestan Cue: Bringing Intelligent Cookware to Life: Wired, April 2017. Could an induction cooktop you control with an app make mealtimes easier for the masses? Review: Breville PolyScience Control Freak by Joe Ray. Wired, 1 April 2016. How induction can bring greater precision to stove-top cooking. The Freedom Cooktop by Charlie Sorrel. Wired, 9 January 2012. A brief review of one of the latest induction cooktops. Induction Seduction by Matthew Fort. The Guardian, 13 September 2010. A food writer raves about his new induction cooktop. Is Induction Cooking Ready to Go Mainstream? by Kim Severson. The New York Times. April 6, 2010. Explores the pros and cons of induction cooktops and asks whether its adoption by professional chefs will prompt greater mainstream uptake. Induction cooktops: Hot new stoves are cold to the touch by Evan Powell. Popular Science, February 1981. How PopSci revealed early induction cooktops to the world over 30 years ago! Induction cooker demonstration by Matt Hodnett of Fulton Innovations demonstrates induction cooking and wireless power to a Guardian blogger. US Patent 3,710,062: Metal base cookware induction heating apparatus having improved power supply and gating control circuit using infra-red temperature sensor and improved induction heating coil arrangement by Philip Peters, Environment/One Corporation, January 9, 1973. and US Patent 3,740,513: Improved consumer oriented combined counter and cooking unit using induction heating by John Matrone and Philip Peters, Environment/One Corporation, June 19, 1973. These early patents show how induction cooktops were always conceived as safer, cleaner, and more convenient alternatives to traditional stoves. US Patent: 9,006,622: Induction cooking by David Beverley et al, Bose Corporation, April 14, 2015. A more modern cooktop with built-in temperature sensors. The Man Who Changed Everything: The Life of James Clerk Maxwell by Basil Mahon. John Wiley, 2015. A relatively new biography of Maxwell that considers the revolutionary effect he had on modern life. Electricity by Chris Woodford. Rosen. 2013 (issued previously by Blackbirch, 2004). One of my own books, this volume explains how scientists have figured out the mysteries of electricity and magnetism, from ancient times to the present day. Ages 9–12. "CERAN" is a registered trademark of Scott Glaswerke, a corporation of the Federal Republic of Germany.